To lighten up the mood of this blog a bit since most of my previous posts have been on the edgy side of things, the outfit I chose for this week is something which everyone is basically comfortable with wearing.. WHITE. One of the trends this Summer is the ‘White-Out.’ Although the all-white clothing thing has been on the runway for quite some time now, white has the tendency to make a person look larger than one really is so proceed with caution. Also, it is better if you choose a material that is thinner in make and avoid bold patterns. For my romper, it's sheer fabric so I didn't have to worry about anything. I know an all-white daytime look might be tough to pull off but if you just pick the right flattering ensembles then this "ultra-chic" look is not impossible for you to try. There is something about this breezy month of July that makes me want to overdo white and wear it head to toe. It is like the urban version of a yachter’s outfit (like what my daydream was all about). In addition, it's a trick to look and feel fresh even when you're at the center of a polluted Metro. Moreover, they say some people wear white as a recall of their youth and innocence. It reminds them of a time when their lives were easier and less complicated. I feel the same way too although I'm not that old yet, wearing white makes me feel like it has the power to "uncomplicate" things. Most importantly, since I'm such a sloppy head, I get to work on my reaction time by wearing white so any form of stain will less likely happen! Although the transparent clutch bag kind of gives you that grade school vibe (remember those plastic envelopes you use before? ), it matches perfectly with my outfit because it's sleek and so futuristic. I just bought it recently and I love it so much because it shows off the wearer’s personality from within.. like what kind of wallet, phone and sunglasses you’re bringing along with you every day. 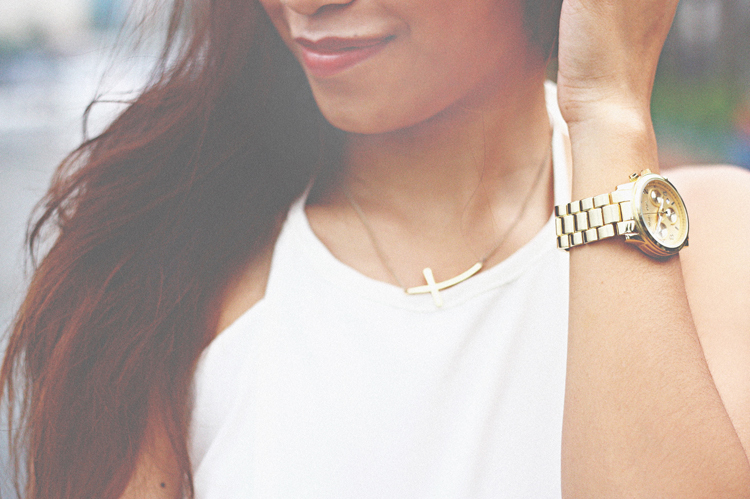 With regard to my accessories, nothing compliments any white clothing better than gold. Period. In the words of Carrie Bradshaw, “Always dress like you will see your worst enemy,” and if that person is looking fantastic in white, so should you! The Style Diplomat's note: Andie and I decided to shoot our outfits together so it would be more fun. I love the way you edit your photos. So beautiful. Btw, do you have a link for those shades? & the transparent clutch? i would love to have 'em! @rona m. Thank you so much! Glad to know you love the photos! I don't have a link. I just bought it from Nava in Rockwell Powerplant :) The transparent clutch is from Bershka in Glorietta :) I hope you can follow me back on bloglovin'!